Good Monday Morning! How is everyone? Sorry for checking out last week. We were out of town for a few days and I was extra busy working on a project that happened over the weekend, so the motivation to blog was pretty low. Tomorrow I'll tell you more about what had me so busy! Thanks to all of you who sent me a note letting me know you missed me, that totally made my day! I'm still digging out and catching up, but today I just wanted to share a some pretty pictures with you of a few changes I've made around the house. First, I scored a fantastic pair of lamps from CL a few weeks ago. They are vintage Ethan Allen and might be just the thing for my bedroom re-do. Even if they don't work out there, I'll find a spot somewhere for them. I replaced the extremely outdated shades with some from a pair of lamps I already had, and I love the new look. Second, I did a quick side table makeover. I picked up this table on major clearance last Spring at Target. Since I didn't have a spot in the house for it right away, I stuck it on the back patio. Over time in the elements, the top got all faded and warped. It was easy to remove and I now had a place in the house to use the table, so I painted the base gold...I'm sure you're shocked at that color choice. :) And, I had a sneaking suspicion that my parents just might have a random marble top laying around their house somewhere, and I was right! It didn't hurt that it had a pretty scalloped edge and fit perfectly inside the top rim. Cheap, quick and easy makeovers...my favorite kind! 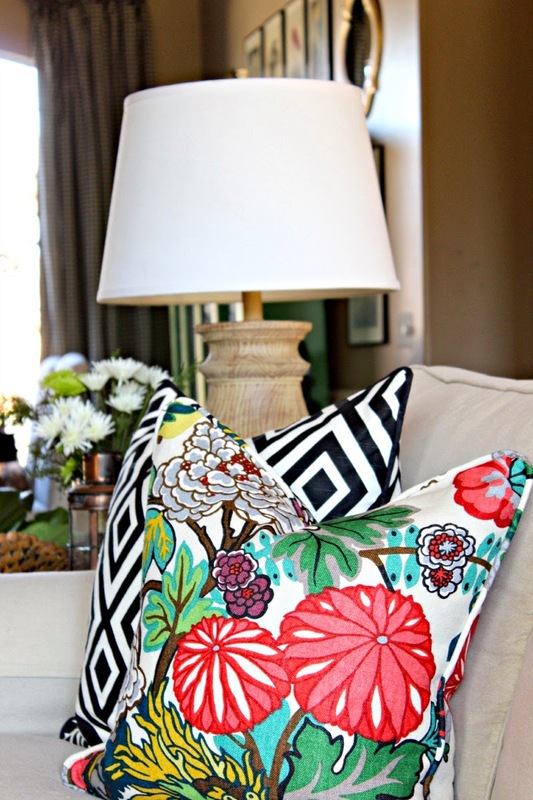 Third, I finally got around to using the extra Chiang Mai fabric that was left over from my chairs to make some pillows. It's the first time I've put piping AND a zipper in a pillow, in the past I've done one or the other. It wasn't too hard, maybe I'll do a tutorial for you sometime. Finally, I left the best for last! My completely ridiculous purchase arrived, and it's fabulous! I've been moving it around trying it out in different places. The sparkles are out of control when the sun hits it! Oh yes, one more thing, I threw out an idea on Instagram and my friends agreed. 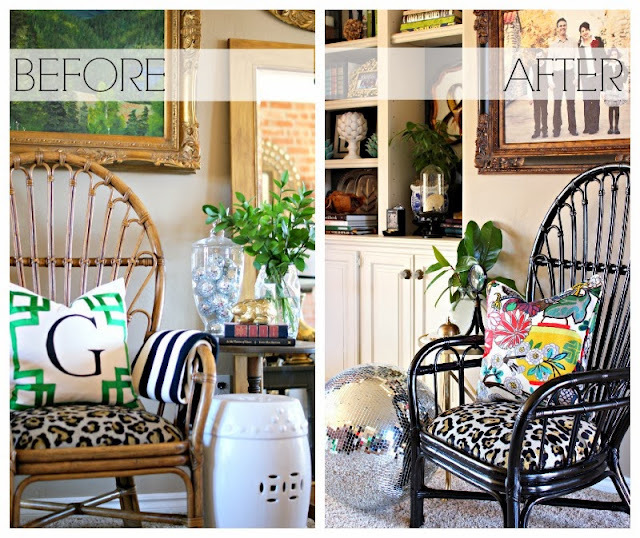 After living with it as is for 9 months, it was time to paint the rattan chair, and I decided on glossy black. That side table looks like it is worth a million bucks!! 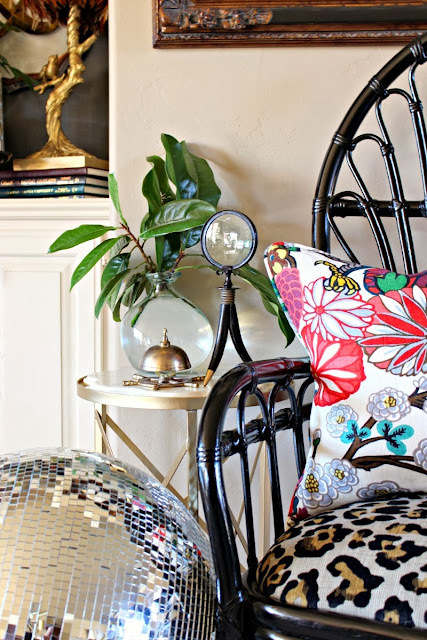 And that chair, and pillows, and, of course, the disco ball!! I can't tell you how in love I am with your house! I can't believe your parents had that piece just laying around!! Lucky girl! All three makeovers look great! what color was the gold you used? i love that it's not so blantly gold. but so pretty! 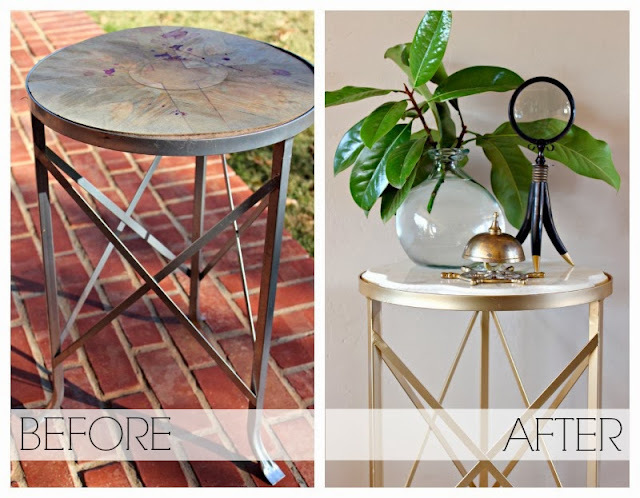 Jennifer I love that side table...awesome makeover!! Love the rattan chair painted black too! Such great additions and easy transformations. Love all of it. 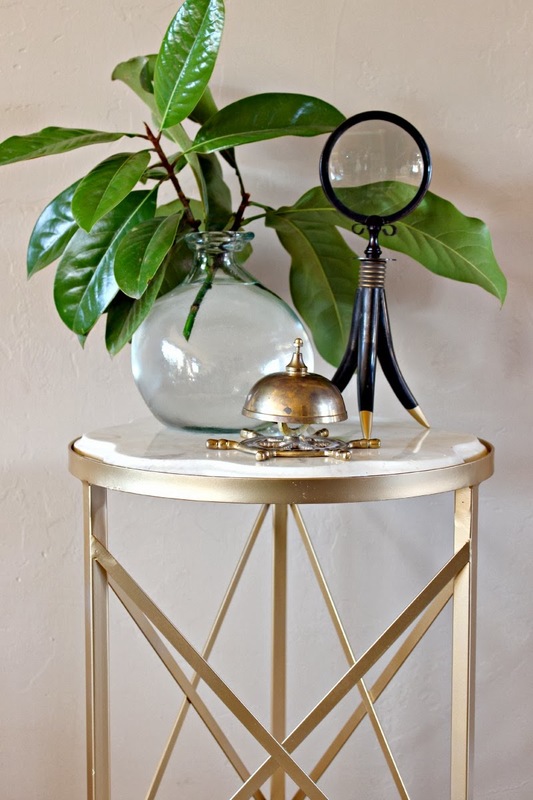 I seriously cannot express enough jealously over that Target accent table makeover. How absolutely breathtaking is that scalloped marble top! It seriously looks like a table that would cost several hundred dollars. Jennifer, I love every change you make. You are inspiring this sixty-five year-old retired teacher. I purchased silver disco ball ornaments for one of my trees this season. Imagine they will reflect all the lit bulbs. Found them at Cracker Barrel. The "new" gold small table is gorgeous! So much good stuff!!! First I am quite envious of that Craig's List purchase and need to check out my own area stat. Second that table looks awesome! As does your chair! The best is the disco ball! Love the reflections on your ceiling! looooove! love the gold table and you know i love the shinydiscoball! Oh, what would we do without our gold spray paint?! 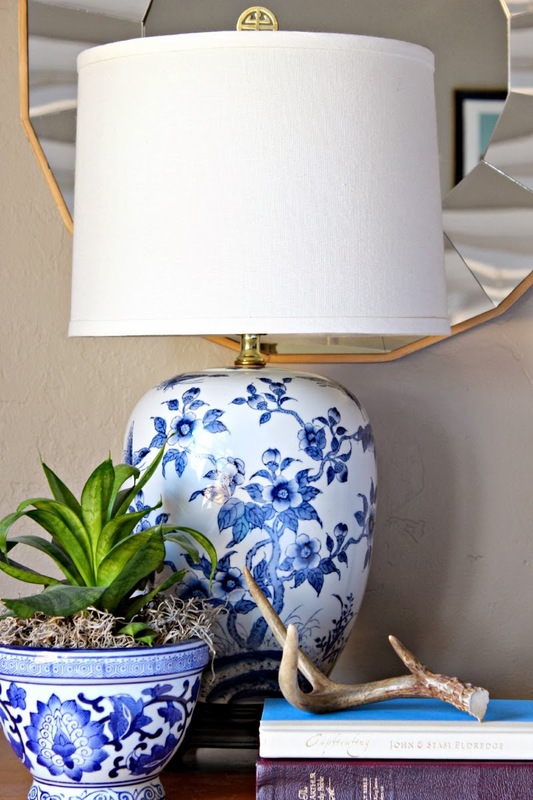 Love your new(ish) table and those pretty lamps are gorgeous!! I love all your other updates as well. Julia, the link for disco ball is in this post. Basically, ebay! I made the seller an offer and he came down a few dollars. Just search for 16" or 20" disco ball and several will come up. LOVE that table!! and that little marble top is to die for! 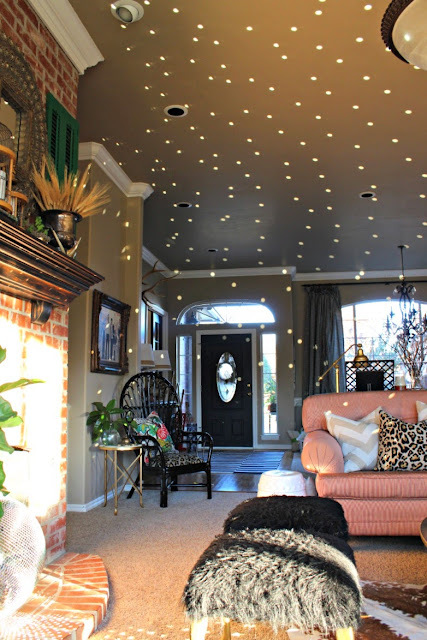 Ok, now I really, really, really want a disco ball!!! Might have to make the purchase soon. And I still love that fabric of yours. The chair looks really nice too. Thanks Emily! :) It's good to be missed! So fun that the marble piece fits in the tabletop so beautifully! Absolutely love it all! I wish we were neighbors, we would be fast and furious with our projects! Love those lamps! I saw them when you posted on IG. I'm dying to add some blue and white at my place. Great updates! I love the lamps and the chair in black looks great. 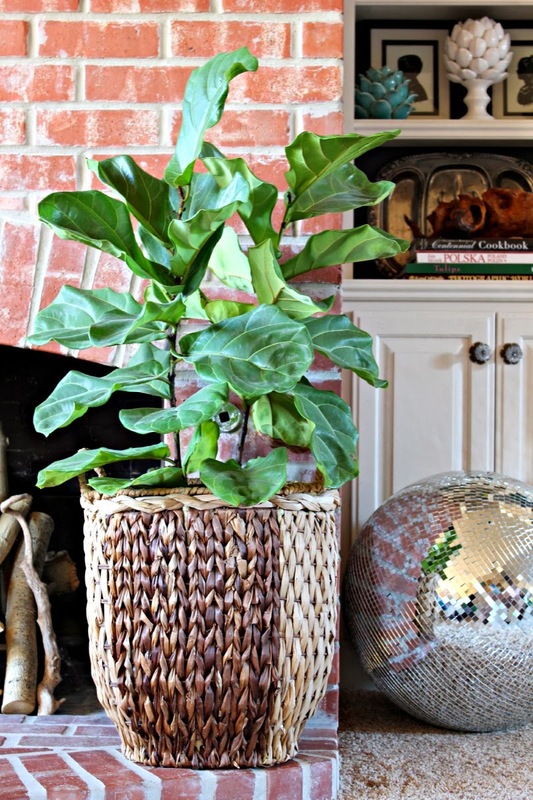 I want a disco ball - where in the world did you find it? Thanks Debbie! I bought it on Ebay, Amazon has some too! Okay lady WHAT is going on with you?! Spill it. 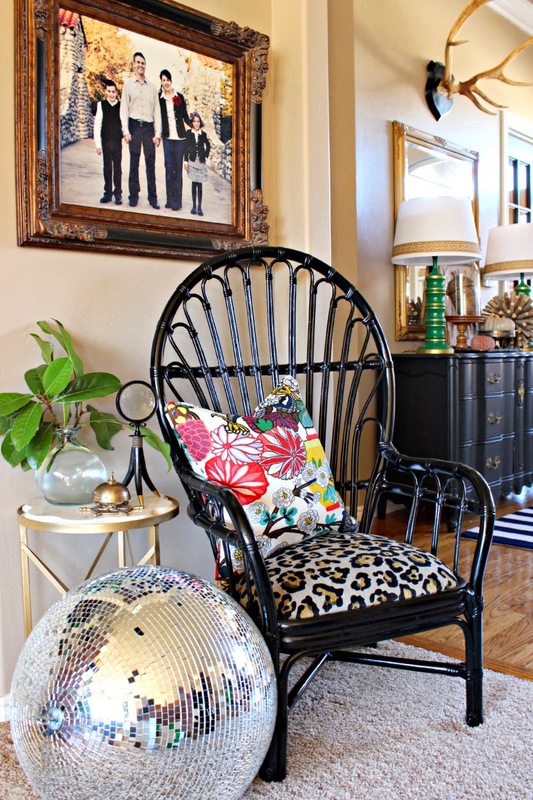 Also…..you know I love the rattan chair in black - gorgeous!!!!!!! Especially with a little dragon action atop it. (Nice job on the such a professional looking pillow btw!) And last but not least, are you kidding me with that amazing scalloped marble table top??? What luck that your parents had it, and that it fit!!! I LOVE it!!!!! All of your makeovers turned out great!! Please do the pillow tutorial! I would love to see how you did the piping and how much fabric that takes up cutting on the bias. I scored two Schumacher Jaipur Tree remnants in poppy that are about a yard each for $10 and I want to do the fabric justice. wow, you've been busy! So many pretty changes! I've decided I might just need a disco ball too. The table looks SO awesome! It's so chic. I also love how the disco ball reflects on the ceilings and walls in your room. 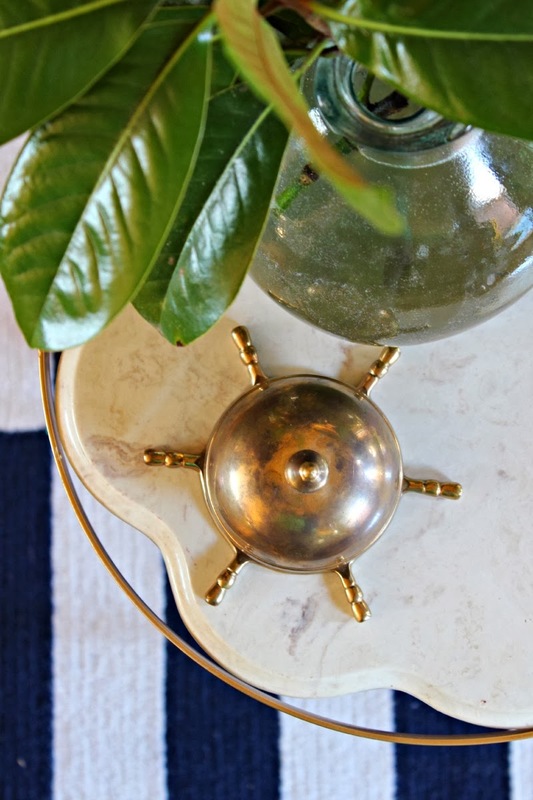 Found ya through the Thrifty Decor Chic link party. Beautiful changes. How fun to have a disco ball! 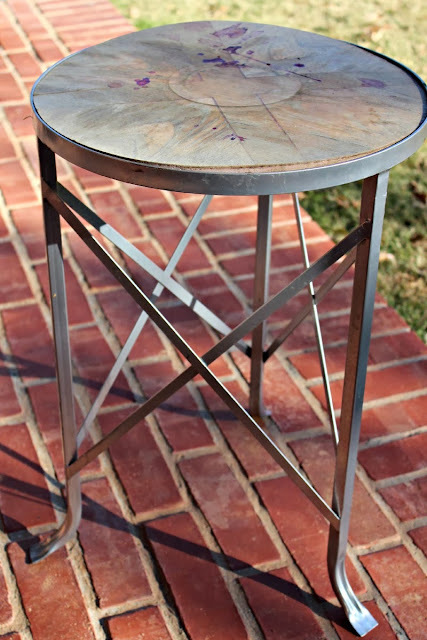 What spray paint did you used on the table base? I've got one I want to paint and that looks like the perfect gold. Thanks! HI Kate, my favorites are Rustoleum Metallic Gold (Home Depot) or Design Master Brilliant Gold (from Michaels). I don't remember for sure but it was probably one of those.